This is a question I asked myself every Wednesday because it’s class day. We weight ourselves before the class so we can update our stats (number of proteins, fruits, veggies, grains, etc, consumed) and the teacher can track our progress. God is bringing me a long way from lack of self-esteem, self hatred, you name it to where I am now: satisfied in who I am in Christ. I still have my “moments”: not wanting to eat a full lunch so that won’t influence the weight is the worse one I’m working through. I want to get to a point where I can just live my life and weight myself because it’s a monthly accountability procedure. It was like that at home and that’s the way I want to go back. 1. Scales are NOT evil. Scales are what we make them. In my opinion they were meant simply to measure the weight. 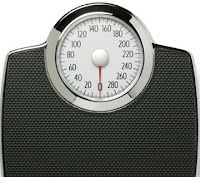 As a person I tried to make my scale into a human being – labeling it evil, etc. 2. Scales are wrong sometimes. Recently I bought a big shot, digital scale, which gives me 3 different weights back to back to back. I learned that when you buy a scale you should put a or 10 lb weight on it and see what the margin of error is. 3. I learned that “out of sight out of mind” works. When my scale used to “live” in my bathroom I was more willing to get on top of it – and to get mad at the inanimate object. Now we keep our scale (I should name it) in our room, inside of our trunk. Yeah, of course I know where it is but there’s something about not seeing it and committing to be more balanced in weighting yourself. God can help you. 4. I learned to be understanding. Many people are struggling with weighing themselves several times a day. I’ve been through it and I know that God doesn’t want me to judge people but to LOVE people where they are. I’m still working through issues but who isn’t? Life and weight management are a journey. I want to be sure it’s FUN!